When McKay and Olsen 32 were announced the winners of the 2017 Top Crew for Safety at the 2018 Safe Start Up breakfast a sharp looking team (dressed in their new 2018 shirt, designed by the crew) led by Mike and Denise made their way to the stage. 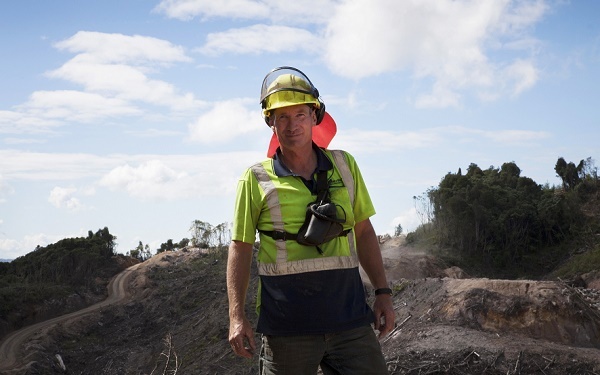 “Comradery is important, we have a great bunch of guys – you are nothing without your men”, says Mike McKay, who together with Denise McKay, Dave Olsen and Blair Tomlinson are the owners and management team for McKay and Olsen. The team is known for its uncompromising attitude to safety, safety leadership, teamwork, and collaboration. McKay and Olsen are currently harvesting Douglas fir in the Southern Waikato area and on a good day you can see out over Lake Taupo. After the site induction it’s time to get to know the crew a little better. Denise takes an active part of the operation and she has a background in business. Her skills are complemented by Blair who has a degree in Forest Science. Mike takes care of the operation and stays available to the crew. “We make our decisions as a team and in collaboration with the crew,” says Denise, “turnover is low, and we celebrate when someone has been with us for 5 years…” and, it doesn’t stop there “…we also celebrate an employee of the month, says Mike”. We asked Mike, what makes you the good leader described by the crew? PF Olsen would like to congratulate everyone at McKay and Olsen Ltd on a well-deserved award.